Finding ways of minimizing fashion’s waste is a growing concern for some within the fashion fraternity. Solutions range from reducing waste at the design and production stage (see Zero Waste patternmaking by Holly McQuillan and Timo Rissanen), through developing simpler and smarter packaging, promotion and retail strategies, and finally dealing with post-consumer waste – i.e. the clothes we no longer need or want as a result of fashion’s never ending cycle and mechanisms of planned obsolesence. Aneeth Arora’s designs for her label Péro (which I will highlight in a forthcoming post on her S/S 2014 line) already have the hallmarks of “sustainable design” – her garments transcend short term fashion fads thus remaining classics in one’s wardrobe, the “love” that goes into each piece means that its possible to become emotionally attached to them, and the fabrics and crafts are ethically sourced and used. In addition, she has also come up with a simple and cute way of dealing with day-to-day fabric waste from her collections. Each doll pictured here (from her stall at this October’s Wills Lifestyle India Fashion Week, WLIFW), represents one of her past collections – the leftover scraps of which make up their tiny garments. Aneeth initially used them for an installation alongside her chota (small) Péro line for kids. 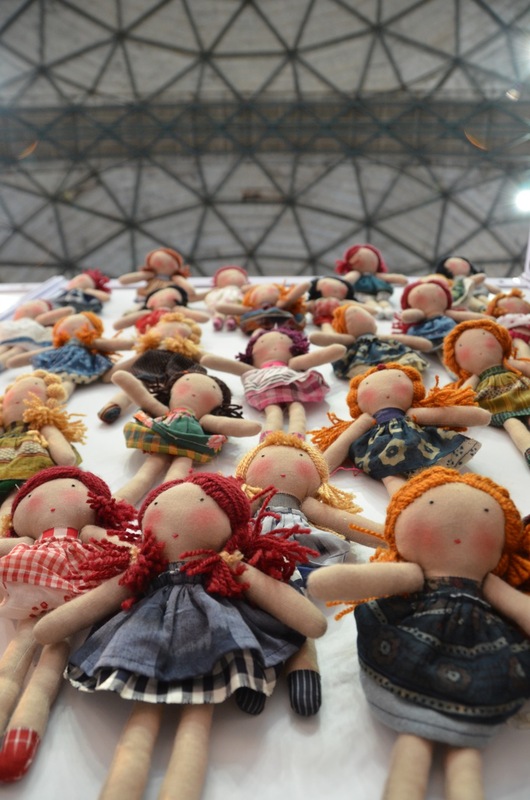 The dolls are labelled with the season and year that the fabrics relate to – thus making them desirable collectors items for any avid Péro follower.